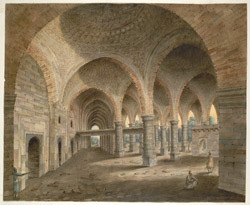 Watercolour of interior of the Adina Mosque at Pandua from 'Views by Seeta Ram from Malda to Gunga Pursaad Vol. II' produced for Lord Moira, afterwards the Marquess of Hastings, by Sita Ram between 1817-21. Marquess of Hastings, the Governor-General of Bengal and the Commander-in-Chief (r.1813-23), was accompanied by artist Sita Ram (flourished c.1810-22) to illustrate his expedition to Bengal in 1817 and his convalescent tour in the Rajmahal Hills in the winter of 1820-21. Idealised view of the many domed interior of the Adina Mosque at Pandua, including the western wall and its niches, and the royal platform. Pandua, near the city of Gaur in the Malda district of Bengal, was a centre of provincial Islamic culture, reaching its apogee when it supplanted Gaur as capital of Bengal from 1342 till the beginning of the 15th century. The Adina Mosque in Pandua, one of the largest in India, was built in c.1375 by Sikandar Shah I (r.1358–90). It is of stone up to the imposts of the arches with the upper part of the building composed of brick, a method of construction which became widespread in Bengal. The basalt stone used was taken from earlier Hindu structures and the brickwork was carved and moulded into diverse patterns. Although the mosque is largely in ruins, it is one of the best surviving examples of early Indo-Islamic architecture. It is well-proportioned and with an austere simplicity despite its immensity, and has been compared to the great 8th century mosque at Damascus. On the rear wall of the prayer hall is a beautiful central mihrab (niche), as well as a smaller additional one, and a minbar (pulpit) in stone. Inscribed below: 'Interior of the Medina Mosque.' 369 by 448 mm.